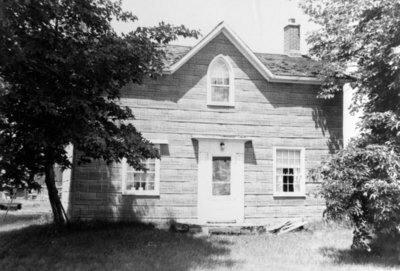 A black and white photograph of a house on Lot 28, Concession 4 in Whitby, Ontario. The frame house was built by John Jones circa 1843 and sold to Frank Puckrin (who already owned Lot 29, Concession 4) in the early 1920s. Weall and Cullen Nurseries purchased the Puckrin (Jones) Farm in 1966. Charlie Chambers, an employee of Leonard Cullen, lived in the house until his death in 1975. The house was moved in 1984 several feet to the west and turned around. It became "Granny's" a gift shop at Cullen Gardens. John Jones House, 1967, Photographer Unknown. Whitby Archives A2013_042_003.